Flowering Date Mid summer and reblooms later in the summer. It produces its first flush of huge blooms in midseason, and then continues to rebloom all the way through fall. 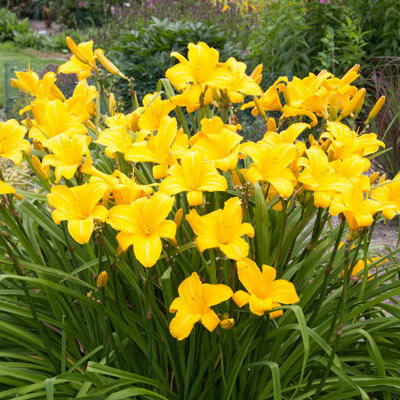 Add large, golden yellow flowers, a high bud count, fragrance, and a strong, healthy growth habit, and you have one excellent daylily! 6" blooms in midseason on 30-32" stems. Reblooms consistently in late season. Flowering Date: Mid summer and reblooms later in the summer. Flower Form: 6" trumpet shaped, outer petals form an exact circle. Soil Requirement: Well drained soil. Additional Information: A Designer Series variety, hybridized by Benzinger. Honorable Mention Award in 2001.